ANTI-NAMA PROTESTERS have taken over a property believed to be owned by the bad bank and have opened it up to the public for today. Members of Unlock NAMA, a campaign to use NAMA buildings for social and community purposes, are currently in a building at 66-67 Great Strand Street in Dublin 1. The group says that the building was formerly owned by a property developer and is now under NAMA ownership. “This is about lifting the veil of secrecy around NAMA and making the buildings available to the public,” Mick O’Broin, a member of the group told TheJournal.ie today. “Some of the buildings owned by NAMA have no commercial use and probably will never be sold, so its’s a no-brainer to give them a social and community use,” he said. The group is holding a number of talks and discussions in the building until 6pm this evening examining the “unmitigated failure” of NAMA and alternative approaches. 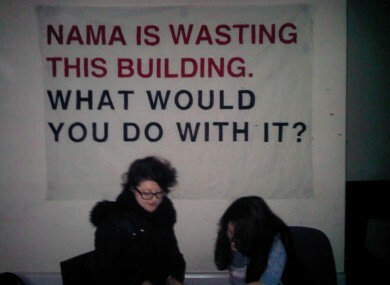 The occupation of the building is the first step in a campaign by the group to highlight NAMA’s assets, which are not fully publicly known, to draw attention to the debt the agency has created and to work to develop alternatives. Email “Protesters take over NAMA-owned building and open it to the public”. Feedback on “Protesters take over NAMA-owned building and open it to the public”.